This is all yours. You’re the owner of this world. Except that hole over there. That’s Ira’s. Back in August, I posted the trailer to Where the Wild Things Are . It was such a delightful couple of minutes that I had very high hopes for the actual movie. The bad news is that few things actually surprised me in this film. The good news is that the movie has the same quirkiness, spirit and overall joy that made me fall in love with the trailer. Max is a lonely little boy with a big imagination. His teenage sister ignores him and the world feels very big and cold. He copes by making up stories and playing in his wolf suit. After a fight with his mom, Max runs away to a place inhabited by aggressive creatures ready to eat him. When Max tell them a not-so-true story about ruling over some vicious Vikings, the Wild Things decide to make him their king. The settings are absolutely beautiful. The “wild” land feels alien and barren at times, but at the same time it’s never completely uninviting. It’s the kind of place that a kid would just start playing in and it works so well. Max helps build an enormous fort/palace and the design is inspiring. Max’s real world (to give it a name) is still shot in a really great way and reflects how Max makes even that mundane world more interesting through his imagination. This is done not so much by the settings but how they actually shoot these few scenes. The first five minutes reminded me a little bit of Scout from To Kill a Mockingbird. Director Spike Jonze definitely had a vision and it came right through. Still, most of this scenery can be found in the trailer and it didn’t have the same wow factor that it did when I first saw it. That was a small disappointment. But the Henson-designed costumes for the Wild Things work magically. Only the faces are digitally animated, but even then it blends in with the actual puppets. They’re like Big Bird: you know they aren’t realistic or accurate, but you happily suspend disbelief for the sake of imagination. The plot of the movie is pretty simple, with Max trying to do things that will make all the Wild Things happy. In particular, he tries to reconcile two of the creatures, Carol (James Gandolfini) and KW (Lauren Ambrose), who have had a falling out before Max arrived on the island. In some ways, their relationship represents Max’s parents’ broken marriage and you can understand why Max wants them to be happy together. Max really grows as a person and starts to learn that people and relationships are more complicated than he realized. Sometimes, things can’t be mended and people can get hurt even when you’re trying to help. It’s a theme subtly worked into the movie, but in a way that kids can understand. I can honestly say Max is played by the best child actor I’ve ever seen. Max Records does a wonderful job of acting like a real kid through and through without being too bratty (and absolutely none of his lines felt forced). This is a caring kid who, when he loses his temper and does something hurtful, really feels remorseful about what he’s done. He’s far from perfect, but he tries. And as he deals with the Wild Things and their many needs, Max starts to appreciate how hard his mom works to keep his family together. In the end, he’s a really thoughtful kid, despite his wild tendencies. The casting of the other characters was truly inspired. While I knew Carol was played by Gandolfini, it didn’t feel like Tony Soprano in a monster suit. 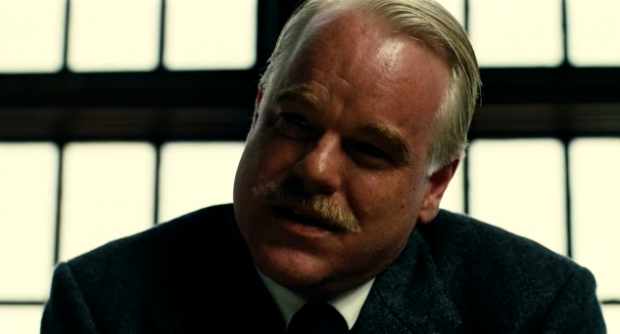 Sure, he’s rough around the edges and volatile at times, but the character is also sensitive and even kind. Ambrose was fantastic as the motherly KW. I was surprised to find out the actress is only 31 years old, considering her voice has so much maturity, which fits the character nicely. 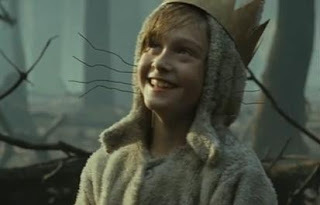 Paul Dano (from There Will Be Blood and Little Miss Sunshine) was great as the quiet goat creature Alexander, who has some of the funniest lines, but is mostly ignored by his fellow Things. The always on key Catherine O’Hara is the skeptical Judith, who makes it quite clear that she is ready to eat Max the second things go wrong. Chris Cooper and Forest Whitaker transcend their normal roles with Douglas and Ira, Carol’s best friend and Judith’s mate respectively. The terrific thing about all the Wild Things is that they have so much childlike naivety that the audience can’t help but love them even when they hurt each other. There is real sadness in this film and you feel it along with them. It’s not always easy to watch, but it’s very genuine. A small problem I found was that the audience quickly realizes that the Wild Things obviously ate whomever the last king was once he made a mistake. I thought it made the rest of the movie too tense too quickly. I also thought Catherine Keener knocked it out of the park as Max’s mom. It’s very easy to make the parent the bad guy in a kid’s movie. She’s not only portrayed as a good mom who’s doing her best, but the audience can see her side while simultaneously understanding Max. When she fights with Max before he runs away, I can honestly say I wouldn’t be able to stay that calm in the same situation (Max actually bites her). There is a quiet moment between Max and her towards the beginning of the movie that feels so natural for a mother and son. You also get to see Max’s teacher (Steve Mousakis), who tells his grade school class that the sun will some day die in a fiery blaze that will consume the earth, but don’t worry, because the human race will die out from our own actions way before that happens. It’s a nice comment on how we live in a worry obsessed society and how we’re passing that onto the next generation. Now, there are going to be people who don’t get this movie, but that’s ok. The filmmakers make bold choices and that won’t translate to everyone. Those who do get it will really enjoy it. Considering this movie is filled with monsters that threaten multiple times to eat the young protagonist, you should know that there are definitely some scary parts in here that should be avoided by the very young. In my personal opinion, 8 years and up should be fine, but obviously use discretion if you are bringing kids. That being said, this is a great film to watch with kids. It’s clever enough for adults while still stimulating enough for the younger audience members and there’s enough in between for both groups to enjoy together. And just like The Wizard of Oz, Where the Wild Things Are teaches kids that no matter where you roam, nothing is better than being with those who love you. And that’s a great message in itself. Overall: Redefines what a live action children’s film can be. The engaging characters and captivating cinematography truly represents the spirit of childhood. Sounds like it's somewhat living up to the hype and I shouldn't be heart broken if I can't find the time to see it while it's in theaters.